One of the great leaders in the Bible is Abraham. He is often referred to as the father of faith, and reading about his life we can find lots of good leadership principles. Here are some leadership lessons from Abraham based on Genesis 12-14. Before we start I just want to say that I will refer to Abraham as Abraham in this text, even though his name in this period actually was Abram and not yet Abraham (he only got the name Abraham in Genesis 17). When we first meet Abraham he lives in Ur in Chaldea with his family. God then tells him to leave the country, bring his family along and move to the land which God will lead him to. It is interesting that God does not name the place he will lead Abraham to, he simply tells Abraham to leave. That requires a whole lot of faith, trust and it can be called risk taking at a high level. One of the most important English language poets in the 20th century, Thomas Stearns Eliot, once wrote: “Only those who will risk going too far can possibly find out how far it is possible to go.” If you want to see results none else has seen before you, you need to go where none else has gone before you. This risk taking lifestyle might lead you into the wilderness and into times where you do not really know what will happen, but just like with Abraham, this is what is needed to get you to the place where you are to be in life. In the story of Abraham we can see that Abraham was obedient to his master, to God. That is why he could walk in faith and walk into the unknown with trust. He new that his master always watched out for him. As believers we need to walk in obedience to our master and that is the most important of all. We also need to learn obedience towards our earthly leaders. Sometimes we tend to believe that the more dirt we can throw on our leaders, bosses and pastors, the better and cooler we become. Still, if you want people to show obedience towards you as a leader, they must first see that you are obedient towards your leaders. It is not enough to have an outer appearance of obedience, it needs to come from the heart. People will see if you just „play” obedient, but on your inside you resist working under leadership and following the instructions of others. The Bible speaks about being „willing and obedient.” It is not enough to be obedient, you also need to be willing. In the first sentences about Abraham in Genesis 12 we can read that God wanted to bless him, and in that way make him a blessing to the nations. In the vision given to Abraham the goal was not about getting rich, placing himself in the center of everything. The vision focused on other people, making the blessings given to Abraham something to be shared with people all around the globe. Your goal need to be higher than yourself. In the very moment I am writing this I just saw that Mark Zuckerberg, the founder of Facebook, announced that he and his wife had given 18 million Facebook shares to the Silicon Valley Community Foundation. Two years ago he signed „The Giving Pledge” where he together with many other rich people in the United States pledge to give most of their wealth to good causes. Doing such things gives a much higher vision for your job, knowing that the work you do will not only give food on the table for you and your family, but it will also help people get schooling, finance projects in your local church, feed children in poor countries and similar welfare initiatives. 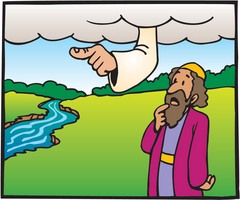 As Abraham arrives in the land of Canaan he stops at the plain of Moreh. According to some Bible teachers a terebinth tree was located here, a sacred tree used by the people in ancient Israel as an oracle. When Abraham arrived, he did not compromise his faith in his own God making a sacrifice by the tree or consulting the oracle, but instead he builds an altar to his own God at the same place. In a business world full of compromise and temptations we must never compromise our faith in God and the teachings of the Bible. Later we can read that Abraham and Lot prospered and this led to strife between their workers (to many employees, to little office space). Abraham immediately said that it is wrong for them to live as enemies, so he made a compromise and they decided to get new office locations, at two different spots. This solved the problem that was about to evolve. This is at the same time an example of Abraham’s humbleness, as he gave Lot the possibility to choose what area he wanted first. As we can see not all compromises are bad, but as Abraham, we need to learn how to compromise the right things. A couple of days ago I wrote an article quoting Michael Jordan who said: „Obstacles don’t have to stop you. If you run into a wall, don’t turn around and give up. Figure out how to climb it, go through it, or work around it.” Abraham was led by God to the land of Canaan, and God promised that this was to be the land of Abraham’s seed. Not long after we read that a big famine arose in the country and Abraham and his relatives moved on to Egypt. I believe many people in the same situation would turn bitter in the same situation! If this is the promised land, if this is what you want me to do, how come there is a famine? For Abraham the solution was to move to Egypt for a certain amount of time. He sought a solution, and he solved the problem. Later he was led back to the land of Canaan again, but for a while it seemed as if something had gone wrong. A leader seeks solutions and as he faces problems such as Abraham, he needs to follow Abraham’s example and look for solutions, instead of giving up or starving as a result of the famine. In Genesis 14 we can read about the Battle of Siddim. In the Battle of Siddim the kings of Jordan were overwhelmed by their enemies and lost the battle against the kings of Mesopotamia. One of the consequences was that Lot was taken captive by the enemy. As Abraham was informed about the battle and the result he gathered his trained servants (318 in total) and persecuted the enemy. After a long persecution they defeated the enemy, they got all the stolen treasures back and of course his nephew Lot. Notice that when Abraham gathered his servants, it does not only say servants, it says trained servants. 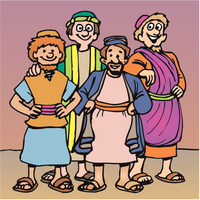 Abraham did not only have people working together with him as servants. He trained them! As a leader you need to develop leaders and teach them skills which again will make it possible for them to do their job in a more excellent way. After retrieving the stolen treasures and liberating Lot, Abraham tithes (gives 10% of everything he’s got) to Melchizedek, king of Salem. The King of Sodom later says that Abram can get all the treasures they returned; all the king wanted was his people back. Abraham refuses to accept the treasures, because he doesn’t want anyone to be able to say that „I made Abraham rich.” Abraham knew that God who controls the heaven and the earth, he is the one able to make rich. Therefore he he is the one that deserves the glory for making rich, not human beings. This does not mean that we should not honor people, but we must be careful not to give glory to people instead of to God. Encourage people, say nice things, give them glory for all the awesome work they do… but, never let that take the glory away from God!